We had a lovely stay at Glenomra House. Mary is the the perfect host. She is so warm, friendly and outgoing and treats you like an old friend. The food was fantastic and the rooms were spacious, clean and very comfortable. We look forward to our next visit there! Our family of four had a lovely stay at Glenomra and would recommend. The location was ideal, just 15 minutes from Shannon airport and a short walk to downtown Ennis where we had dinner.The rooms were very clean and there is a nice common area living room. Best of all, though, was Mary's breakfast. She had a wonderful array of cheese and meats as well as berries raspberry, blueberry, strawberry, yogurts, a variety of fresh bread and cereal - in addition to a choice of hot, full breakfast entries. Mary was a welcoming and friendly host. She recommended we visit The Burren Perfumerly, which was an oasis in the barren landscape. Mary and her staff are delightful and are an excellent example of Irish hospitality. Thy were kind and accommodating to my two young daughters throughout our stay. Additionally, they were very communicative regarding our missing luggage which allowed us to go out and enjoy our trip. The food was delicious and there were many options. We would definitely stay here again. Siamo stati una notte durante un tour in Irlanda, bella casa a 2 piani, non lontano dal centro di Ennis. Trovata con il Garmin grazie al benzinaio Apple Green proprio accanto. La padrona di casa Mary di una simpatia unica, risponde subito alle varie email. Scelta per le buonissime recensioni su TripAdvisor che confermo in pieno. Bella camera grande piena di luce, buon bagno, in zona tranquilla. Ottimo wifi, parcheggio privato. Buona colazione con un po' di tutto. Avevo avvisato che ero Celiaca e Mary mi ha fatto trovare pane gluten free. La consiglio vivamente se si passa per Ennis. Very nice place for your stay in Ennis. We stayed for 2 nights, and were very pleased with the accomodation. Within Walking distance to the centre, Clean and parking facilities in front of the door. Our stay at Glenomra House was the perfect start to our Irish holiday. Mary greeted us promptly upon arrival and after a long overnight flight made sure our room was ready. The room itself was comfortable and quiet. Breakfast was ample and delicious. The location is great, quiet but an easy walk to town. Mary is a gracious and charming host. My wife and I stayed at the Glenomra House during this May's Fleadh Nua music festival. Mary is a wonderful hostess serving the most appetizing breakfasts each morning. The B&B was spotless and within easy walking distance of many local attractions. A very good B and B - comfortable room and lovely guest lounge and dining area. Spotlessly clean. Lovely hostess, Mary. Excellent breakfast. About fifteen minutes walk from town centre. We had a room at the back of the house, which was very quiet and peaceful. Our family stayed at the Glenomra House for 6 nights and loved our stay. Mary as well as her staff are delightful and attentive. The breakfasts are sumptuous! It is an easy 10 minute walk to the center of Ennis a medieval town. Wonderful spot from which to see Ennis. Quiet, comfortable and close to town. Mary was so helpful and cooked a terrific breakfast of anything you'd like. What a way to start a trip! We very much enjoyed our stay with Mary. She is a helpful host and a delightful lady. The room was very cozy and the bathroom very spacious. Breakfast was delicious. Nice location, excellent condition, Mary was wonderful, breakfast was great, wish we spent more time there. Mary Earlie is an absolute delight and the best reason to stay at Glenomra House. On top of that, Glenomra House is within walking distance of downtown, has a private parking lot, is quiet, comfortable and the breakfasts are ample and delicious. A generous sideboard includes fresh fruit, various breads, many kinds of cheese, yogurt, juices, cereal and meats. And probably even more things I don’t remember. All of this is in addition to a hot breakfast and fresh brewed coffee. And Mary will serve an early breakfast upon prior request if you have an early flight to catch - and it’s within and often less than an easy 30 minute drive to Shannon Airport. And it’s always worth mentioning that the shower pressure is good. Stay at Glenomra House for its location and comfort, but love Glenomra House for conversation with Mary Earlie. Loved our stay here for 4 nights. Mary is lovely, friendly, helpful and fun. Breakfasts are great, with lots of variety. Convenient walk to town. Would definitely stay here again. Thanks, Mary for a memorable visit! Our stay was very pleasant indeed . The breakfast was lovely with a great selection of food to choose from . The only little thing I found fault with were the pillows ....they were very flat ..other than that all good! We enjoyed our stay at Glenomra House. We arrived early and both of our rooms were ready and we were warmly welcomed. Mary was very accommodating and made our night there both comfortable and enjoyable! This was a great location for our last night in Ireland before a flight out of Shannon the next morning. Accommodations were clean and comfortable. It was an easy walk into town for dinner and shopping. Our host was most gracious in allowing us to eat breakfast early so we could make our airport departure time. Wonderful breakfast, loved the lampswool blanket on the bed... and especially Mary's generous, unexpected kindness in driving us to the bus station. Highest recommendation! We loved our stay at Glenomra House! Mary was an amazing host! The room was very clean and lovely! The location was great! Easy to walk downtown. The breakfast was delicious! A large selection of meats, cheeses, fresh fruit, yogourt and cereals on the buffet and a wonderfully cooked hot breakfast too! We will definitely stay here when we return to Ennis! Wonderful experience made even better by owner Mary. Breakfast made to order! Highly recommend! We had a wonderful time at Glenomra House, only two nights but really wonderful!!! The house is in a very good order and has atmosphere. Breakfast is very good and Mary is a host par excellence. We arrived late and she took us by car to the next and very good restaurant in town. She told us about the region and was interested in what we are doing in Eire. At last we had a very good time at Glenomra House. We had an amazing 3 nights' stay here! Mary is hilarious and super helpful, the breakfast was the most delicious in our whole trip across the country, and the rooms were consistently clean. Would stay again! A simply wonderful place run by the most charming and lovely Mary!! Mary and her staff went out of their way to make you feel right at home! Very helpful in giving advice, comfortable and relaxing rooms, excellent breakfasts, and great conversation! Close enough to town an easy 5-10 minute walk but far enough away to be peaceful. Can't say enough how nice Mary, her staff, and Glenomra House are! Will definitely return next time we're in the area. First class, very comfortable, convenient to town and easy to find. Proprieters very helpful and welcoming. Excellent breakfasts. Would be more than happy to stay there again. Very nice hostess/owner, Mary. She was helpful with directions and great places to eat, shop or visit historic. The rooms were very nice and the beds were so comfy. The sheets were so soft and smelled wonderful. The breakfast was very nice indeed and she cooks to order but what she had laid out was more than enough for my daughter and I. Superb bread!! The place was quiet and a steal pricing! I would go there again in a heartbeat. Glenomra House is located within an easy walk to the center of Ennis. The rooms were immaculate, comfortable, and roomy. Breakfast was exceptional with several made to order choices as well as an extensive buffet including a variety of breads, cheeses, and fruits. Our hostess, Mary, could not have been more gracious in welcoming us into her home. She was kind enough to do laundry for us and pointed us in the right direction where we could find good food, drink, and music. She went above and beyond the call in preparing a to-go breakfast the morning we had a very early tee time in Lahinch. If you are staying in Ennis, don't miss the opportunity to stay here. Irish hospitality at its best. Un B&B très agréable où nous avons dormi dans une chambre charmante, au calme sur le grand jardin. A 15/20 minutes de marche du centre d'Ennis. Excellent accueil et très bon petit déjeuner. Très bon endroit à Ennis. Bon accueil, personnel sympa et proche du centre ville. Le tout à un prix correct. We stayed there only 1 night. The room was big and very clean. The bed was ok. The breakfast was good. 10-15 min walk to downtown. Very good base to visit the Cliffs and Burren National Park. Everything was perfect! The house is gorgeous and immaculate, and my room and bathroom were very comfortable. Breakfast was delicious, with plenty of choices and hot food expertly prepared, The hosts were gracious and very helpful. Could not have been more happy with my stay... there's a lot more to see and do in Ennis than I had planned for, and I wish I could have stayed longer. We had such a fantastic time....Mary is a wonderful hostess and couldn't do enough for us. Ennis is great and we very much the restaurant that Mary recommended and booked! for us. Breakfast was outstanding, lunch wasn't needed. We will be back! Glenomra is an excellent, purpose built house for B & B accommodation with owners' living quarters and therefore the rooms feel spacious and the entrance hall too. Mary is very friendly and welcoming and the lounge available to guests has Sky TV which is great if you're hoping to watch something not available on the bedroom channels. We enjoyed our couple of days in County Clare and up to see the Burren and coastal region. Limerick City is not too far for an interesting day out. We stayed four nights in June. It was slightly cooler than the heatwave which all of the country & UK had experienced. We were on holiday for two weeks exploring Ireland - there's plenty more to see! Great last night in Ireland before an early flight next day. Walked to city center and rested up that evening. Everything was great! This was one of our favorite places. Mary was a gracious host, the other guests were friendly and we enjoyed several fun conversations. Glenomra House is centrally located in Ennis, making it easy to get off in the morning for our day of exploring and then close to restaurants and pubs in the evening. Stayed two separate nights, one on our way from Connemara to Dingle and then again the night before our flight out. Great location, 20 minutes from Shannon airport. The Glenomra House B&B was the best B&B we stayed at on our recent trip to Ireland and Wales. The room was a nice size, wonderful bathroom and the bed was comfortable. Mary is a very warm, gracious host and the breakfast was over the top. We will definitely book here on our next trip to the Emerald Isle. We enjoyed our stay at Glenomra House very much! Mary was so friendly and fun, the room was great, and breakfast was excellent! One of the loveliest places I have stayed. Mary, the owner is gracious and lovely. The room was immaculate and restful and the breakfasts had a nice variety of delicious foods. I would definitely return there again and again. We had a very pleasant stay at Glenomra House. The house is tastefully decorated, with a warm atmosphere. Mary made us feel very welcome and helped out with every possible query we had. The breakfast she served was a feast, the best we had in Ireland during our two weeks' stay! Out of our recent 2 week Ireland fling using all B&B's I have to say the Mary was our favorite hostess! Her husband is great as well. She is genuine, funny and so helpful. Mary, we all laughed at some of your sayings and they became our "inside joke" during our stay in Ireland She is a wonderful cook as well- the breakfast was delicious. Her home is immaculate and tastefully decorated. The bathrooms are updated and clean with a shelf to put toiletries, if needed plus a hook on the inside bathroom door to hang my toiletry bag not all B&B's think of these! Fresh flowers greeted us in the foyer. Mary offered to drive us into Ennis since she was headed that way as well. It saved the men from driving and parking while us girls shopped : We will definitely make sure we include her B&B next time we visit Ireland and will stay at least 3 nights this time coming the 20 minutes from Shannon airport. If we depart from Shannon,, we will return to her B&B at least for the last night. HIGHLY RECOMMENDED!! Thanks Mary!! Eileen, Bob, Michael, Kelly and Conor. Best home away from home with warm, friendly and helpful hostess. Mary made us feel very welcome and her local knowledge helped us easily traverse the local areas from a tourist perspective, with relative ease. We found the accommodation very warm and clean with breakfast a real delight and would recommend this establishment to anyone looking to relax or to those wanting a base to explore the area. We had a very nice stay and enjoyed the days in Ennis and Glenomra House. Breakfast, room, distance to the city were all perfect. Comfortable room in a very nice house. Very good breakfast. Subway nearby if you don't feel like a big dinner after a day of traveling. Glenomra House is a lovely B&B located only a few minutes outside Ennis city centre. Our room was light and airy and very comfortable although the shower pressure was very weak. The owner was extremely polite and couldn't do enough to help us. Would definitely recommend staying. Wir haben eine Nacht im Glenomra House verbracht und können es durch und durch weiterempfehlen. Mary und ihr Team sind so nett und gastfreundlich. Das Haus ist gemütlich, wohnlich, die Zimmer sind schön, die Betten bequem und das Frühstück ist einfach fantastisch. Da bleiben keine Wünsche offen. Bei unserer fast dreiwöchigen Radtour durch Irland ganz sicher das beste b+b! Glenomra House is a wonderful place to stay in Ennis. Close enough to walk to the center of town, yet just enough removed to maintain peace and quiet when you are ready for bed. The staff were amazing and made us feel right at home. Each room has updated en-suite bathrooms and is very clean and comfortable. When you combine all of that with the price, Glenomra House will be the only place I stay in the area from now on. Bon accueil! Jolie chambre douillette. À distance de marche du centre-ville. Bon déjeuner varié selon vos goûts. Bon scone aux canneberges! Bon rapport qualité-prix. Je recommande. We stayed at B and Bs throughout our trip and liked all of them, but this was my overall favorite. We could walk to the center of the town so parking was not a problem. The room was fine and the food delicious. Mary was warm and welcoming and a genuine Irish woman! This was also the best value. Really lovely place to say with easy access to town. Mary is a great host. Excellente adresse à Ennis près du Burren et des falaises de Moher 40 minutes. Nous y étions en famille avec 2 enfants et avons réservé 2 chambres côte à côte. Les chambres étaient parfaites : spacieuses, extrêmement propres, décorées sobrement avec goût. La propriétaire est accueillante, chaleureuse, de bon conseil et vraiment à l'écoute. Le petit déjeuner plus que copieux et bon pour attaquer une journée de visite. Nous recommandons ce B&B sans réserve. What a wonderful stay we had in Glenomra house. Mary was so helpful. Breakfast was very tasty and rooms were lovely. Would highly recommend. Thank you Mary! We had a lovely stay at Glenomra House. Nicely located for an easy walk into the town centre and the many and varied shops and eateries, also a small theatre where we saw Johnny Mcevoy perform as a birthday treat for my husband. Our ensuite room was clean and bright and the bed very comfortable. Breakfast was a highlight, wide choice of cereals, fruit and full Irish all served by our lovely hostess. Not to mention the wonderful warm scones, delicious! Highly recommend. Mary was wonderful! She was so sweet and friendly. She took absolutely wonderful care of us. The rooms were clean, the beds were comfortable and the breakfast was super yummy. Very easy walk into the town center. We loved it, and would definitely stay again! Nice and kindness owner. warm and clean room. good breakfast. thabk you!! Maelle and I spent a delicious moment : every thing was more than nice : the owner was so welcoming with us, the room was very good and the breakfast terrific. I highly recommend this place. Mary Earlie is a charming and witty host. She goes out of her way to make you comfortable in this charming B&B that is conveniently located. It is a quick walk to downtown and Shannon Airport is within a 30 minute drive. And that is allowing for some traffic. Despite its proximity to town, the B&B is very quiet and conducive to a great night's sleep. I have stayed here on 3 different trips from the US in a span of 4 years. Mary has always provided us a very early full Irish breakfast the morning of our flight -- which is complemented by a sideboard full of specialty cheeses, breads, jams, yogurt, fresh fruit. This is a huge treat at such an early hour. Just give her a heads up that you will need an early breakfast. 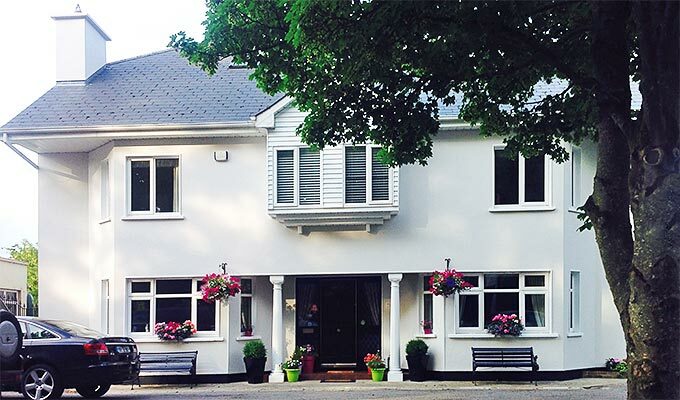 Glenomra House is a great place to stay if you are arriving or leaving from Shannon Airport or if you need a place to overnight while road tripping through Ireland. Mary accommodates a wide range of arrival hours. And you get to stay in a big comfortable home with one of the friendliest and funniest women in Ireland. If you stay here, the Poet's Corner at The Old Ground Hotel is an easy walk from the B&B and their food is delicious and it is Irish pub atmosphere at its finest. Glenomra House is our favorite B&B in Ireland. We make it a point to stay a few days there before we leave for home - Shannon Airport is only a few kilometers away. Mary E. is a terrific host and a very pleasant conversationalist. She goes out of her way to make things comfortable. The breakfasts are excellent as well. I highly recommend Glenomra House. We had a one night stay at Glenomra. Perfect location for a short walk into town. Extremely clean and comfortable. Mary, our hostess, is friendly, funny, and knowledgeable about her surroundings. She even washed my husbands clothes because he had taken a fall and his pants and jacket were covered in mud. Thank you Mary. Mary was a great hostess in everyway. We were without a car it is an easy walk getting around Ennis. Mary provided us with suggestions, directions, & even a lift a couple of times without us asking. I wasn't sure what to expect with noise from other guests, but it wasn't an issue. We weren't the only guests but I don't know how many others were there. The B&B was very clean, & a convient & easy walk from the station Mary provided directions to get to the house. We had a wonderful stay. Just perfect. Would love to come back. Very friendly and helpful hosts. Location was great and we even walked into Ennis. Close to Shannon Airport, 20 minute drive. Everything clean and lovely breakfast..
A very nice and perfect "in shape" B&B! Mary is a wonderful and very smart owner and her breakfast is uncopyable. Perfect for 2 nights at Ennis. We will recommend you, Mary! I chose this B&B due to the rave reviews given about Mary, the owner/operator. Well she was all that and more! In addition to my room being as lovely as the photos, Mary was even lovelier! She not only had great recommendations for pubs and sites but she personally set up a tour for me. It was what happened next that was truly outstanding! During a day tour I tripped and fell and broke my wrist. Mary responded as if I was her family.I was travelling alone She not only came to visit me in the hospital but she came again when I was discharged, brought my luggage and made arrangements to get me back to Dublin so I could return home. She was amazing and I will always be grateful! And I can't wait to return to her B&B to stay & finish the rest of my tour! Great BB. Very clean, friendly and accommodating. Excellent breakfast. We arrived in Ireland elated to be there, exhausted from our journey, and badly in need of a couple of hours sleep. Mary made sure our rooms were ready as quickly as possible and welcomed us with warm smiles and hugs. Very homey and comfortable, great location. Mary was the star of the trip as she was such a wonderful woman and great hostess. The breakfasts served in a beautiful dining room overlooking her garden were tasty and generous. Would definitely stay there again if I am ever blessed to return to this beautiful country. What a fantastic B&B, the best we stayed at during our 7 day motorcycling trip around the Wild Atlantic Way. We arrived to a super friendly welcome from Mary and a lovely comfortable bedroom. Mary, our host, gave us excellent advice on somewhere near to eat and drink - The Poets Corner, even though the portions were too big for either me or my wife to finish. Breakfast at Glenomra continued in the same vein, more choice and food than even the largest eater could do justice to. Many bowls of fruit in juice, fresh fruit, cheeses, cold meats, breads, croissants, cakes, juices, tea, coffee, toast and a full Irish cooked breakfast with a couple of lovely scones just to finish things off, absolutely fantastic. We regularly tour the west coast of Ireland and would happily go out of my way to stay here again, cannot recommend highly enough. It was wonderful! Owner very helpful! It was so nice to be able to walk to the downtown area of Ennis. The home was lovely, welcoming and very clean. Breakfast was great! Enjoy your stay! Loved our stay here. Our hosts were quick to communicate after booking and very friendly. The rooms were wonderful and the breakfast was great. The B&B had a lovely homey feel and was a nice walk into town. If I had to do it again, I would have stayed longer and used Glenomra House as a home base rather than relocating to less impressive B&Bs along the west coast. Had a wonderful stay here! Host is awesome! Great place and location! We had a lovely one night stay in Glenomra recently and the service was impeccable. The room was lovely and the breakfast the following morning was accompanied by a great chat with the landlady. I would have no qualms about recommending this B&B to any potential visitors out there. Very quaint and excellent breakfast including breads, meats, cheeses, plus ordering what you wanted eggs, bacon, sausage, crepes The host was very kind and helpful--would highly recommend. I stayed here with my daughter ,my sister and niece . A really lovely B&B, we were made very welcome , the accommodation was comfortable and spotless . The breakfast selection delicious and varied. Mary ,the owner, is wonderful . If I was staying in Ennis again this is where I would stay. This is a great place to stay in Ennis. A short walk into the town center, easy and safe. The inn keeper is extraordinary. We arrived into town late on a Saturday night. Thanks to the inn keeper we got a great table at an amazing restaurant. We highly recommend this B&B. Eccellente servizio. La Signora Anne è una padrona di casa gentile, affabile e disponibile. La struttura è estremamente pulita, la camera a noi assegnata ampia, pulita e sulenziosa. Ottima posizione per il centro cità che si raggiunge a piedi in pochi minuti. Veramente consigliato. Beautiful house, fantastic and comfortable bedrooms, good breakfast with a lot of choices. We had a kind and friendly welcome, and Mary made us feel very comfortable during our stay at the house. Had a lovely stay here at the start of August for 1 night. Beautiful house with gorgeous decor and a very welcoming host and within good walking distance of Ennis town. Breakfast of scambled eggs/ fruit and yogurt was lovely. Well worth the price. Spotlessly clean and comfortable, with a beautiful garden and delicious breakfast. Mary was wonderful and went out of her way to make us feel welcomed and relaxed. We felt that we were with family! Absolutely lovely! We cannot fault it. The hostess was really friendly and welcoming and the atmosphere was relaxed and the breakfast was absolutely delicious. Would really recommend staying here. Also perfect location if you are landing late at Shannon airport & for visiting Ennis. Very large apartments close to the city centre. Very nice hosts, generous breakfast... Our only problem was that we were cold during the night in July! but then we reckon that's what happens when you're from further south and not used to the Irish temperature range. What a wonderful and welcoming place to stay! Mary immediately made us feel at home after our long plane ride. Glenomra House is beautiful, and our breakfast was delicious. We greatly enjoyed seeing Ennis on our first day in Ireland. Mary helped us plan our next destination and gave us suggestions of what to see on the way. We would definitely stay here again! Mary was a lovely hostess Her rooms were bright and comfortable, and ours overlooked her lovely gardens. Her breakfasts were delicious! She gave very helpful suggestions for dinner as well! Mary was a lovely host, very friendly and made sure you had whatever you needed. Room was comfortable and breakfast was good. We stayed at Glenomra House for two nights in June. Mary was incredibly sweet, helpful, and made us feel right at home. She went above and beyond for us- letting us use the phone, even doing our laundry so we could head out for the day. The room was comfortable, roomy, and very homey. The bathroom in our room was big and had everything we needed. Breakfast was delicious, and they made special eggs for my pregnant wife. Overall, this was our favorite B&B on the trip! This was our first trip to Ireland and our first stay at a B&B. Glenomra House exceeded our expectations on all counts. Mary does a great job providing an inviting warm home with a fantastic breakfast in the morning. We would highly recommend Glenomra House. Very nice house, well located. We spent one night in this B&B and people are so welcoming we really felt like at home!!! They have little attention for you and are very nice. If you are searching for a B&B in Ennis, go there! We stayed here just after landing in Shannon. The host was polite and the service excellent. Just a short walk to downtown Ennis. The floor was a little squeaky but otherwise we had a lovely stay! Mary is such an incredibly hospitable host! She went out of her way to make sure we had a room, even though we booked the day of. The room was extremely clean and my very first Irish breakfast was simply spectacular. Thank you again, Mary! Lovely property, well- appointed rooms that are bright and airy and roomy. Mary is a cheerful and helpful hostess. Would eagerly stay there again if traveling to Ennis. Lovely house, clean comfortable rooms, friendly helpful hosts. Well located within walking distance to town. Outstanding in every detail, Mary the perfect host and couldn't ask any more from a bed and breakfast accommodation setting. Highly recommended and will be going back. It was a perfect stay, the breakfast was lovely the best in the West. Marie was so friendly and helpfull. Perfect location for a visit to the West . The Cliffs, Burren , Galway are all drivable and the Shannon Airport is 20 minutes away. The accommodations are excellent and the hospitality is superb. When we return , we will most definitely stay at the Glenomra House. I booked a night at Glenomra House because I needed a place to stay relatively close to Shannon Airport prior to an early morning flight. The next time I travel to the area I will book at Glenomra because it is a very nice place to stay. I was very satisfied with everything about it. From the beginning, I was a little concerned because I was playing a late round of golf at Laninch prior to my arrival and thought that my arrival time might be a problem. Not at all. I contacted Mary and she was very understanding. Then when I drove to Ennis, I found that the house was on a main road, very easy to find, with adequate off street parking. Then I walked in and was welcomed warmly. My room was very nice in appearance and it was comfortable. I was going to be out the door at 6 AM the next day, which was too early for breakfast, but Mary wrapped up some scones for me and reminded me that there was a coffee maker in my room, and I was good to go. It was very helpful. The drive to the airport the next morning was sort and easy. I had no complaints or concerns about my stay and hope that I can make it a longer one the next time. And finally, the price was very reasonable. If you are traveling in or around Ennis, Glenomra House is an excellent choice for lodging. Great stay! Absolutely perfect. Thousand thanks, Mary! We will see you again! Excellent location, great accommodation and very friendly hostess who was very willing to provide iron and board as well as advice about food etc. definitely recommend for tourists as well as business travel. Absolutely best B and B I visited in all of Ireland. To begin with, Mary, the host is gracious, lovely, kind, and an excellent cook. It was the best breakfast I had my whole trip in Ireland. I had the traditional Irish fry, however, Mary offered many healthy and organic choices. Her home and my room were immaculate. Everything smelled so fresh, my bed was so comfortable, and the towels were of high quality. I felt like I was staying at my grandmother's home with how welcome I felt, the delicious breakfast, and how comfortable and clean it was. It is an easy walk to the village roughly 8/10 of a mile---if that far and a short drive from Shannon Airport. I truly cannot wait to get back to Ireland and Glenomra House. We recently enjoyed a most enjoyable stay at Glenomra B & B. Mary was the pefect host with a good sense of humour and great conversation. The food and service were first class and the location was was ideal. Hghly rommended. Nice ambience. Friendly staff. Owner went out of her way to accommodate our son in a separate room so we weren't so crowded. Great service. We stayed 2 nights at Glenomra as our first experience of an Irish B&B. It was a wise choice. The accommodation was immaculate. The host Mary was absolutely lovely. So helpful and a very classy lady. The breakfast was sumptuous and nothing was too much trouble. Mary provided a wide choice of cereals, pastries,fruits, yoghurt and full cooked breakfasts. Best of all were her fruit scones. We had such a positive experience that we expected the same throughout the rest of Ireland. None lived up to Mary's high standards. I highly recommend this B&B. We got on our way as we were arriving at night time and had a horrible GPS. I called the B&B and spoke to Mary and she was most helpful. On our arrival we were hungry but too tired to go anywhere to eat. Mary knew us for all of 2 min and insisted we eat and drove us into town and dropped us off at a great restaurant with the best live traditional Irish music I heard all my trip. The walk back from town to the B&B is not more than 10min. The breakfast is great with variety. Mary was an excellent host and very kind. I would definitely stay at Glenomra again. We arrived at 10pm after keeping Mary posted on our whereabouts. Despite the hour she greeted us with a warm smile and a laugh. Glenomra is a wonderful facility with a fabulous host and a beautiful, made to order, home cooked breakfast. We wish our plans could have allowed us more time there and way more time to chat with Mary. Thanks Mary - we can assure you that we will be highly recommending you and Glenomra to anyone visiting lovely Ennis. Beautiful and clean. Mary is an exceptionally terrific host; she provided helpful recommendations on routes and dining. Hoping to come back and spend more time there. Plenty of Parking, Good WiFi, Smart Clean Rooms, Quality Breakfast 2nd to none with amazing Choice, Very Convenient 10 min walk to the town, Friendly and attentive host. We wish Mary all the success for the future, she deserves it. Our stay was just great, Mary is a marvelous host. She was welcoming, the breakfast ample, the cooked food personalized and the room nicely decorated and comfortable, with a view of the garden. The location was easy to find, parking convenient and a leisure ten-minute walk to the center of town. Would love to stay there again. Nous nous souviendrons longtemps de Glenomra House. Tout d'abord la localisation est très bonne dans Ennis : pas loin du centre, facile d'accès et de plus, seulement à 20 mn de l'aéroport. Les chambres sont très bien aménagées, décorées avec bon gout, la literie est confortable. Mais surtout, Mary, la Maîtresse des lieux, a un sens de l'accueil hors du commun. Elle est vraiment au service de ses hôtes et les gratifie de sa gentillesse et de son sens de l'humour. Sans parler des superbes breakfast qu'elle prépare et cuisine... Nous savons où aller si nous revenons. What a treat to meet Mary and stay in her lovely home. Our room was on the back side of the house so we didn't hear the street noise as much. What a beautiful breakfast with fresh fruits, yoghurts, breads ,cheeses, scones and Mary cooked us eggs and beans and grilled tomatoes etc. She is a most gracious hostess and funny. Makes you feel most welcome. Thank you Mary . Perfect. We'll stay there again on our next trip to Ireland. Nice rooms, great assortment at breakfast, Inn keeper was attentive and helpful. A real 'home' in a foreign country. The best B and B I really ever visited : very comfortable, welcoming, with a huge cold breakfast available in self-service hams and other delicatessen, fishes and cheese of all sorts, yogourts, fresh fruits and fruits in sirops, a variety of breads,... plus a cooked breakfast at your choice you can order to your nice hostess, Mary, if you wish. The rooms are lovely, comfortable and very tidy. Everything is beautifully, artistically and minutely decorated. From the dining room, you have a beautiful view on a very well kept and peaceful garden. You can really relax and feel well; Il would definitly recommend it, especially to people loving quiet, welcoming and beautiful places. A warm and very friendly place. We liked it very much. A wonderful, warm and welcoming B&B. I would definitely recommend it and would stay there again in the future. The room was lovely and spacious. Breakfast in the morning was wonderful and nothing was too much. we received a lovely warm welcome when we arrived, had a very comfortable stay and were treated extremely well. I stayed at the beautiful Gelnomra for 2 nights although I wished I stayed longer. The location is a 10 minute walk from the train/bus station and the town with its cute shops, boutiques, and museum. The host, Mary, was lovely, lively and just plainly wonderful. The room where I stayed is tastefully decorated and comfortable. I truly loved that there was a vanity table making it easy and comfortable to get ready. During breakfast time, you'll find an array of breads, cheeses, lots of fruits, and more. Mary's scones are to die for. I am tremendously pleased with my stay there and cannot wait to go back. All the best to Mary and her B&B. One of The Best B&B or hotels in all I've ever stayed. Beautiful, quiet, clean rooms. Lots of travelling books available to scan around. Good size parking place onsite for car and walk to town about 5-10 minutes. Very very convenient. But the best parts of Glenomra was amazing breakfast with anything under sun you can possibly hope for especially if you look for healthier eating options with plenty of fruits and berries were surprisingly available too and last but not least The host is amazing person who makes you feel so at home. Funny and quirky at its best like only Irish can be. Many thanks we really enjoyed! Glenomra House is a beautiful B&B, located close to Ennis citycentre. We loved our stay there, Mary is a lovely and very friendly person! Good breakfast and a beautiful room! I hightly recommend Glenomra for a real Irish bed and breakfast experience! Mary was the perfect host, welcoming, helpful, chatty and interesting, bedroom was beautiful and the house decor had a very calming effect. Breakfast was 5, full Irish along with a great selection of meats, cheeses, fresh fruit etc. and home baked scones! As it happened I left my jacket in the house and Mary kindly posted it on to me. Can't ask for more! We had a wonderful stay at Glenomra. Mary was fantastic, the location was perfect for walking around Ennis and the room was spotless. Loved our experience and can't wait to come again!! This was a lovely stay, a perfect breakfast, a good atmosphere, the rooms were causy and Lynne is so very nice and enthousiastic. Glenomra House was a very lovely bed and breakfast. We only stayed one night but it was a very pleasant experience. It was a short walk into town and it was a 15-20 minute drive to Shannon Airport. So the location was perfect for our last night in Ireland. The breakfast was excellent and our host was delightful. We enjoyed staying at Glenomra House. The location was great and the food was very good! One of the best places we stayed on our month long holiday, impeccable service, more than you could ask for. Mary was marvellous and went out of her way to look after us, would love to go back some day. 100% satisfaction guaranteed. Hemos pasado una amiga y yo este fin de semana en casa de Mery. Hemos quedado encantadas y Mery nos pidió expresamente que pusiéramos las reviews en español así podríamos animar a más gente española a pasara por su casa. Ella es encantadora, y desde luego hemos quedado muy contentas. La casa es enorme, y con unos jardines grandes también. El servicio excepcional y el desayuno muy abundante y muy rico. Desde luego que volveremos. Very comfortable and convenient. Mary was welcoming and helpful. A short walk into town for an excellent dinner at the hotel pub. Easy drive to Shannon airport in the morning. Everything was just perfect. Beautiful rooms and very lovely people! We will be happy to visit Glenomra House again. Mary is the most friendly, gracious and generous host we came across on our trip to Ireland. The location gave us plenty of time for sightseeing. The room was very comfortable with everything we needed at hand. The full Irish breakfast was amazing. Do yourself a favour and if you plan to go to Ireland make a point of staying at the Glenomra House. Mary greeted us warmly upon our arrival and was very accommodating during our stay. She made restaurant recommendations that were helpful and arranged a taxi for us. Upon leaving we had an early moring departure, so she set us up with delicious scones and fruit to start our day. Thank you, Mary! The room was quite nice and comfortable. We'd recommend a stay at Glenomra House for anyone visiting Ennis. It is a little walk to town, but very doable for those without a car. My husband & I had a wonderful 2 night stay. The place was clean the breakfast was delicious & Mary was a very entertaining hostess. Only a short walk to town made it convenient. Have to admit someone could have told us Clare road=limerick road & we missed the sign a couple of times it really needs a better sign. We would definitely come back when staying in Ennis. We had a wonderful stay at this B and B. The hostess Mary is wonderful. She is personable and very helpful. She let us in to our room early so we could crash after an all night flight from the states. Her breakfasts were delicious with a wonderful assortment of cheeses and meat. My husband enjoyed the hot cooked breakfast. Mary is an awesome host. The rooms were fine and the breakfast was great. Would definitely stay again. Very clean. Nice owner. Plenty of parking. Walking distance to town including O'Halloran's music bar which I recommend, although a couple blocks of the walk are sketchy. The town area seems safe enough, though. Under 15 minutes from Shannon airport. I have no complaints. This place was great for the price. Séjour très agréable, accueil chaleureux de Mary et son époux; aide pour organiser les excursions, suggestions. Chambre agréable, propre, nettoyée +linges changés tous les jours. Bref séjour magnifique et adresse à recommander !! Mary was very friendly and accommodating. Easy walk into town. Good central location for sightseeing and golf in Clare. Be was in need of new mattress and box springs. Everything else was great. The house was beautiful - our room was clean, neat, and very nice. The host was very helpful and even went out of her way to make sure that we got to visit the nearby Cliffs of Moher. We will definitely be back when we return to Ireland! Dieses B&B ist sehr zu empfehlen: günstige Lage, gutes Preis-Leistungs-Verhältnis, super leckeres Frühstück, sehr sauber, aber das Beste war Mary, eine wirklich äußerst warmherzige, witzige und imponierende Persönlichkeit, kurz eine wunderbare Gastgeberin. Bei unserem nächsten Irlandaufenthalt werden wir dort auf jeden Fall wieder übernachten. I can not say enough about Mary and her B&B. She is so gracious and generous. We missed a connecting flight from Newark, NJ to Shannon due to weather conditions and were delayed for 2 days. Meanwhile, three of our children, aged 18 to 22, were on their way to Ennis. Mary and I kept in contact through email. She let me know when my children arrived and took wonderful care of them until we were able to collect them. This was our first trip out of the country and needless to say I was a little concerned that my kids may get lost trying to find the B&B or whatever. A mothers imagination: The Glenmora house is right on the main road from the airport and is centrally located to the city center. My kids were able to explore the city on foot and had a wonderful time even before we arrived. Thanks Mary! You will be hearing from us again when we come back!! It was the best B&B on our whole journey through Ireland! We stayed at 11 different B&B's or Bed & Breakfast "Houses" in our 14 day journey across the Emerald Isle. This one is about location, location, location~ close to the Shannon Airport. The owner was accommodating and cordial. It is what I would call a 'high volume' B&B that offers form and function. The price is right- its clean & neat- however, there are virtually only 1-2 Average restaurants near you. What we saw of Ennis, driving through side to side-back-to-back, was not desirable. Very nice owner but, we didn't stay for breakfast as I had a problem with our Hertz Rental Car and left early. Séjour effectué en avril 2012 avec nos 3 enfants. De tous les B&B dans lesquels nous nous sommes arrêtés, c'est de loin celui qui nous a laissé le plus grand souvenir accueil, chambres, petit déjeuner et surtout Mary, la propriétaire. Adorable maison. Si vous devez en choisir un à Ennis, c'est là que vous devez venir ! Vraiment. Fantastic! Great welcome, cosy room, excellent breakfast, highly recommended!!! A wonderfull nights stay. Walking distance to restuarants, entertainment and shops. Mary was quite the hostess and what a sense of humor! It was such a shame.. The owner gave our room to someone else because she thought "we would not come..."
It was an excellent stay. Very good accomodation and excellent breakfast. Many thanks to Mary who was always very kind and helpful. Highly recommended B&B! A very pleasant stay in this B&B where we had a warm welcome. Our hostess was very agreeable and gave us good advices for our journey. The breafasts were good and varied and the B&B is well located is you want to go out in pubs at night. I had a great stay at glenomra house. i'd book again anytime. Mary was a terrific hostess. Room was immaculate and very comfortable.